India map was the most common one, but animal shapes like kangaroo or cheetah too weren’t uncommon. We used to have a lot of fun, letting our imagination run wild, while savouring those out of shape rotis. The good thing was, no matter what the shape is, the taste was fine. Coming to these Sel rotis, which are quite popular in Sikkim, the shape is nowhere close to how it should look like! But again, the taste was fine, so I guess, it’s ok…for a first trial, at least. While looking for Sikkim recipes, I came across this NDTV article which talks about the culinary changes that has come over the place. There was a mention about Sel roti in there and that helped me decide the menu. A bit more digging showed that Sel roti is originally from Nepal and is eaten with potatoes in various forms, aloo ko achar being one amongst many. This is a nice post about Sel rotis. 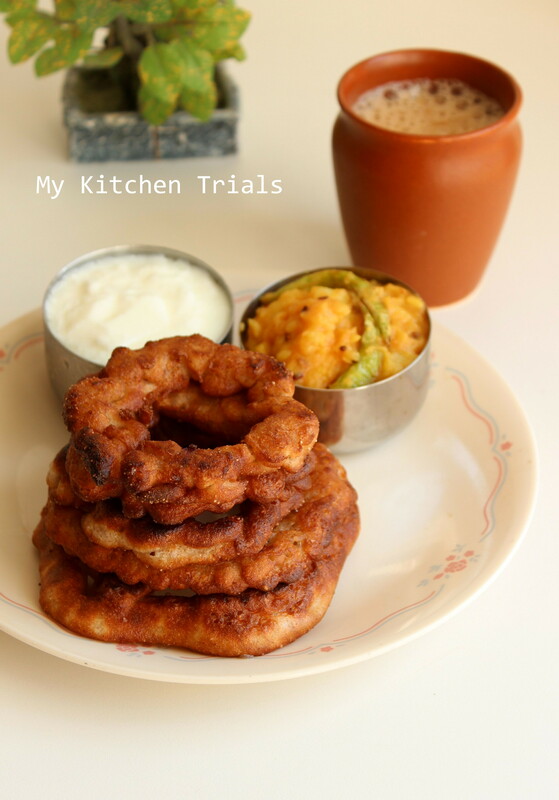 Though I tried the given combination of potato and sel roti, with yogurt, I couldn’t understand the combination-connection. The sel roti was great, the potato was great, but there was no chemistry between the two! May be, these are acquired tastes or may be I should try out the original before passing that statement :-). I loved the Sel roti, despite its poor shape. I first used a coke bottle and the batter oozed out completely. Then I used a squeezable ketch up bottle, that’s how I got the wriggly Sel rotis. I tried pouring from my hand as well. The shape wasn’t great, but it wasn’t bad either. 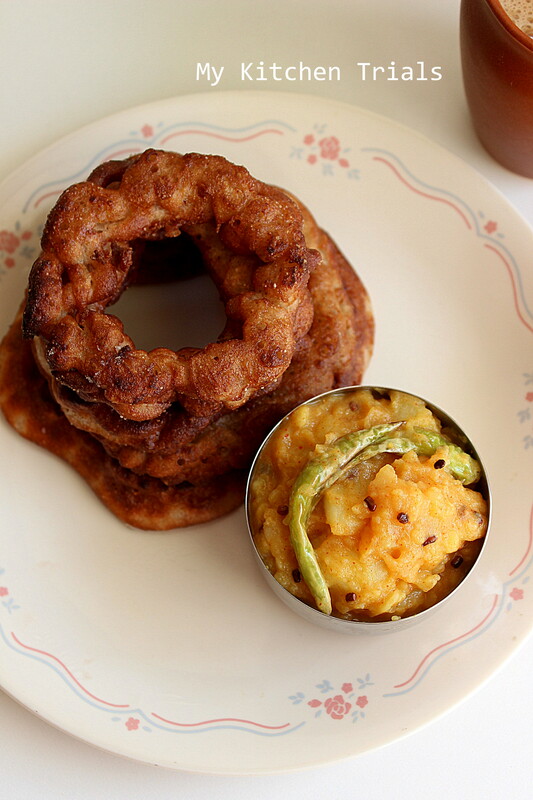 Sael Roti/Sel Roti : A dough nut shaped deep-fried roti. Made of rice flour. Sel roti looks different and very crispy, never mind the shape this rotis makes me drool,can have it happily with the aloo ka achaar. and that site you have linked is awesome..wondering how I never got that..will be reading in detail again..thanks! do not care of the shape as far as it tastes good!! now that is looking delicious!! They make not have the perfect round shape but they have a lovely golden color. The combo looks great even though the dishes did not go with one another. same pinch,I too made the sel rotis..yours has come out very well don’t mind about the shape,it looks good and love the color of the sel rotis..
Lovely tempting colorful ones, Rajani. Even I failed to understand how these roties can be served with curries. I liked it as it is and in fact did not even try eating it with curries. Just munched away all day until I finished it all. I too tried this, didn’t have the dare to post with that awkward shapes, but the taste was yum!!! I m eyeing that potato achaar!!! The shapes dont matter as long as they taste good! They look good to me. With that wiggly look, they look kinda cute. And potato dish sounds delicious. How do you actually overcome the uneven shape? I tried it too first with a boottle followed by a butterpaper piping bag and then free hand. I think disposable plastic paper bags can be used.